The annual Sundance Film Festival, held each January in Park City, Utah, is widely recognized as the premier showcase for American and international independent film. Inclusive and eclectic in its programming approach, the festival has grown to include film culture events, panel discussions, youth programs, online exhibition, and live music. 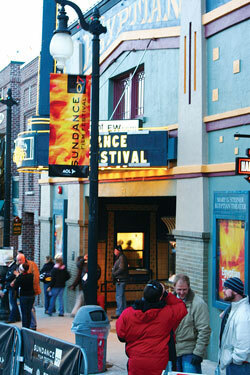 Attended by more than 45,000 people from around the world each year and with an online audience exceeding 1,000,000 users, the Sundance Film Festival creates a vibrant, unique community of artists and audiences that extends well beyond the mountains of Park City, Utah. The annual early August Park City Arts Festival is one of the summer's biggest draws. Artists and craftsman from around the world come to show and sell their beautiful art pieces. There are also numerous art galleries throughout town which exhibit great artwork from around the world. The Kimball Art Center provides exhibition space for talented local and regional as well as world-famous artists. Visit www.kimball-art.org for more info.